We have so much to celebrate coming up! Jessica is coming to Cupcake's baptism and we couldn't be more thrilled! We really wanted to baptize her today, on her nameday, but the church was beyond booked and couldn't squeeze us in anywhere even though we are bringing our own priest. Our dear friend and favorite Cistercian father who married us has also baptized all of our children. So instead, it will be next weekend on my mom's very special something-th birthday! A lady doesn't reveal her age, right? Who am I kidding? This year, anything we do is more for us than for her and since taking care of her is our top priority, I think we will just keep it simple. Caramel Lattes sound simple! 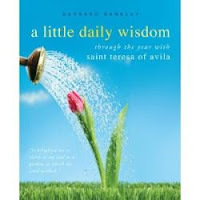 And a quick minute to read from this book that strengthened me so many times throughout my pregnancy. It's a true gem! I wish I could explain God's secrets. If it would help anyone, I would utter a thousand foolish comments. Perhaps a few of them will make sense and result in great praise to God. That book looks wonderful! Happy birthday to your mama and happy name day to sweet little cupcake!! Heck, get some carmels and call it done!! Or make those lattes! 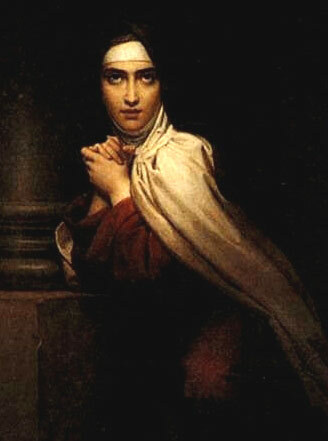 Happy feast of St. Teresa of Avila, and Happy Nameday to that sweet little soon-to-be goddaughter of ours!! I am so excited and can hardly wait to see/meet you all later this week! Happy happy name day. What a yummy treat. Love the pictures of her. I like the ruffle outfit too. Many belated blessing to your cupcake on her nameday.